Founded in 2008, this series of unique lectures and dinners is held at the Institute of Irish Studies, University of Liverpool. The lectures have brought an outstanding line-up of speakers to the podium to share their insights, knowledge, experiences, fears and hopes for the relationship between two great neighbours and nations. The President of Ireland, The First Minister of Northern Ireland, past- Prime Ministers (Taoiseach), past-Presidents, a leading Ambassador (now Ireland’s man in Washington DC), Journalists and UK Ministers and Members of Parliament have all delivered the annual lectures to shed light on their individual recollections and contributions to UK-Irish relations, the delivery of peace, and their visions for the future of both nations. The Institute has been supported and championed since it was a mere concept by John and his family. Attendances have been high since the late Dr Kevin McNamara, former Labour MP and Shadow Secretary of State for Northern Ireland delivered the inaugural lecture in 2008. Sir Patrick Duffy, a Kennedy Lecturer in his own right in 2010, has also Chaired two special John Kennedy lectures in Ireland. The 12th Kennedy Lecture will be delivered by the former Taoiseach Bertie Ahern on 22 November 2018. 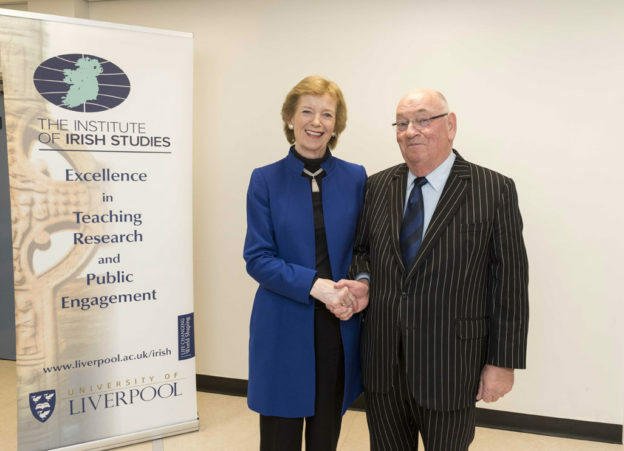 Photograph shows Mary Robinson, former President of Ireland and the 2016 Dr John Kennedy lecturer.